It seemed going into the spring, that Michigan's QB situation was pretty simple to distinguish. Tate had the obvious advantage of running the bulk of the offense in 2009. Denard, while the more athletic of the two, struggled at time with his passes last year. It would have seemed pretty clear that Forcier would have been the overwhelming choice for starter in 2010. Of course, that was all before we started spring practice. Gardner stands 6 foot 4 inches tall. Boasts a 200+ pound frame. He has a very strong arm, and runs effortlessly much like a Vince Young-style QB. He seems to be designed perfectly for running the Rodriguez spread-option. Most thought that he'd get a good look in the spring, but ultimately would fall in line behind Forcier and Robinson as the 3rd-string QB for the fall. But as things seem to be progressing, Gardner is making a name for himself. Everything that I have been reading and hearing so far from spring camp is that Tate does look better than he did last year, but he remains inconsistent with his throws and his reads. In short, he has good days, and bad days. Not exactly the type of improvement Michigan coaches are looking for from a 2nd year starter in this system. I'm not entirely surprised to hear this. Tate is a very confident player, but he's also not the prototypical QB for this system. And it's true that you can't always trust what you read on message boards, but deep down I think that Tate, while a great QB who can make amazing plays, may not be the most fit QB to lead this offense. But neither is Denard. At least not the Denard we saw in 2009. When he entered a game at QB, everyone and their grandma knew that he was going to take off running as soon as the ball was snapped. Now I do hear that his throws have gotten better, but his biggest asset is still his speed and allusiveness. I want to see Denard on the field as much as possible this fall, but not at the QB spot. So here's the big question. Which QB offers the best leadership? Can this offense thrive behind Forcier? Is Denard better fit to be able to manage a game? And what do we know about Gardner? Chad Henne wasn't the greatest QB Michigan has ever had, but he might have been the best at managing a game, and putting players in the best position to make big plays. And that's something that only comes with natural skill and experience. I now have some doubt that Tate Forcier is going to be starter on Sept. 4th. His experience is likely his biggest asset. But I don't think his biggest competition is going to come from Denard. I think Devin Gardner is maybe the next big QB for Michigan. Of course I say that without ever seeing him play...so I don't hold me to that. But from everything I read and hear, Devin is the exact type of QB Michigan needs to run this offense. Even as a freshman, his skill level is far above what Tate has last year at this time. Also, according to reports, all three QBs are about at the same level as far as knowledge of this offense...which blows my mind. In last Saturday's scrimmage, Gardner was running with the 1st team for longer than one would expect a early-enrolled freshman to do so. This is either really good news for Michigan fans, or really bad. This Saturday at 1PM, we'll all have a chance to see for ourselves. I don't really believe the quarterbacks are at the same level of knowledge. Which reports are you referring to? The coaches have consistently said that Gardner is behind the other two, and that is what they would expect. 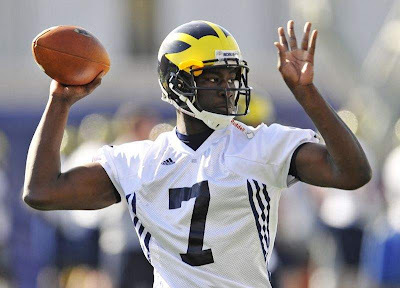 The main news this Spring from what I've heard has been the development of Denard at QB, and how he has improved his passing and can run the whole offense. Not sure how you can say you don't want to see him at QB until you've seen him play this year. Of course, I'll believe it when I see it and in the long run Gardner is probably a better answer at quarterback, but Gardner in his 5th year is going to be a lot more helpful to this program than Gardner this year.